How did VeloDirt get started? We’ve been doing this for about five years. It kind of happened by accident. We were out on a big road ride and it turned out almost all the roads we were on were gravel. I’d never done any riding like that before. But we were stuck out in the middle of nowhere so we had to ride it anyways. It was super fun. We started organizing the informal rides that we do. The Dalles Mountain ride we do out of the Dalles was the first one and it’s taken off from there. We’ve put together a bunch of backpacking routes around the state. Some of the rides we’re doing, if they’re good enough, we’ll post them on the website. There’s not as much information on the website as I would like, but I’m slowly working on that. We don’t make any money off of this, it’s just part time stuff. Is there any specific goal for the project? Are you trying to help promote this sort of riding in Oregon? Yeah. I’m not interested in trying to figure out a way to make money off of this. I’ve had people who seem to wonder why I don’t want to. But that’s not my focus. My focus is on promoting bikepacking, getting people out on these back roads. Especially in a place like Oregon where we have a lot of remote areas to go ride in. I think all of the best riding is out in the middle of nowhere. It seems like people need that nudge where they have a route they can go follow. Most people aren’t willing to just look at a map and drive out to a spot to go ride their bike because they don’t quite know what they’re getting into. With the routes that we post, I try not to provide too much information. It’s not a guidebook, but it’s usually enough to get people out to check out the route. As far as I know most people seem to enjoy them. I don’t actually know how many people go ride the routes. Occasionally I hear about it, but usually not. On the Oregon Outback route. Photo by Gabriel Amadeus. 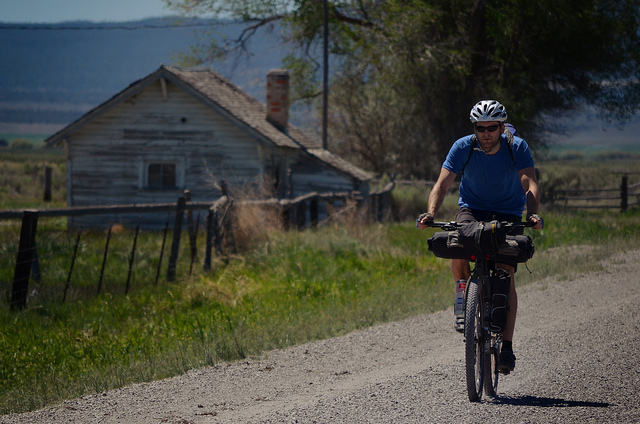 Did you get your start with bikepacking five years ago on that Dalles ride? That’s where it got started for me. I started doing some gravel touring. Then I got into the bikepacking. I have incrementally pushed the size of the routes, how remote and committing they are, how much navigation they require. I did some riding before the Dalles trip. I’d done some road touring. That’s what got me into cycling originally. I was into alpine climbing and backpacking and to me road touring was just another version of that stuff. Instead of putting all your stuff in a backpack and hiking you throw it on a bike and you go ride and spend weeks at a time doing trips. But I started riding a lot more when I got into bikepacking. What’s the appeal to that sort of riding? The biggest appeal is generally you have no traffic. You see a lot of stuff you wouldn’t ordinarily see. There’s a lot of weird geological things in Oregon and most of them are well off the beaten path. You could theoretically drive to a lot of these places, but it’s a lot more interesting to ride to them. We just did a four day trip down in far southeast Oregon to the Sheldon-Hart hot springs. There weren’t services on the route at all. No gas stations. No nothing. We carried food for four days. It was out in the desert so we had to carry water for a few days. That’s the kind of stuff that I like–really remote difficult riding, challenging conditions, challenging routes, challenging navigation. Somewhere in the desert on the Sheldon-Hart Hotsprings Route. Photo by Gabriel Amadeus. Perhaps tough to narrow down to just one or two, but tell me about some of your favorite adventures over the years. I’d say the biggest, most memorable trip is when I spent a couple weeks up in Alaska. We did a big tour through Denali National Park and a couple other places. And the Oregon Outback trip we did last year that we’re doing a semi-organized thing on this year. Then the hot springs route we did last weekend was amazing. It was awesome. With the Outback, I’d been trying to find a mostly-dirt route across the state, whether east to west or north to south. And it’s really hard in Oregon to put something like that together, in part because of all the rivers and mountains. It’s hard to link up a mostly straight line across the state and do so in a way that you can easily get to or get home from. The starting point for the Outback is Klamath Falls. From Portland I can ride my bike to the train and take the train down to Klamath Falls. It’s as far south as you can get with public transportation without boxing your bike up and getting on a bus. I mapped a route from there back up north to near the Dalles. We didn’t really know what we were getting into. But it turned out the route was really, really good. We decided to do one of these informal rides and the response has been pretty crazy. We had almost 400 people who–I won’t call it registration because it’s not really registration–signed up to get more information about the route because they wanted to come ride it. We shut it down and told people to go ride it some other time because there were going to be too many people on it for one weekend. It’s pretty remote. There are only services in three or four towns along the way. There are significant sections with no water, one of which is 80 miles with no water at all. It’s not quite in the desert, but part of the route goes through a region of southern Oregon called the Oregon Outback, which is where the name is from. We’re going to do a ride. I can’t call it a race, I can’t call it an event. I have towed the line with government organizations who would otherwise want permits and insurance and stuff like that. Right now I seem to have found a happy place where they’re going to let us do it without us having to jump through a whole bunch of hoops. But I have to be really careful about what I say about it. I know there are going to be people who come and they’re going to race it. And there are others who are going to come and take their time and take a week enjoying themselves. I don’t really care what you do. It doesn’t matter to me as long as you’re coming out and having a good time. At some of these events around the country where they do long routes, it’s strictly focused on racing. That’s awesome and it’s great that people want to race the Outback route. But we’re not going to say one way or another what you should or shouldn’t be doing. Living in Seattle, I know lots of people who are planning to do the Outback and it’s across the board what people’s goals are. Some people want to be in camp before dark every night and others want to ride until 2 in the morning. I know a handful of guys who are not going to stop. They’re not taking camping gear. They’ll just ride straight through. I’m going to do it as fast as I can. I’ve ridden the route, so I have less incentive to do it in the scenic way like we did last time. I’m hoping to do it in about three days. I’ll push as hard as I can and see how I can do. The Outback is certainly your most ambitious–we’ll just call it a “thing”–to date. What are you excited about and are there any big concerns going into it? I’m excited about how excited everybody else is. There are people buying bikes and building bikes and getting bikes modified with braze-ons on their forks and things like that. And buying bikepacking gear. Bikepacking isn’t as big here in Oregon as it is in other places because there were so many people that didn’t have the proper gear to go. My impression is that with so many people now getting set up to do these kinds of rides, this is the beginning of a big thing. Now you’re going to have the bike and have all the gear and you’re going to go out exploring or riding other routes we’ve put up. It’s gotten really popular around the country. Now Oregon’s going to catch up and then some. As far as concerns, it’s a big route and there are some people who I don’t think quite understand what they’re getting themselves into. And while we take no responsibility for anything anyone does, there’s always that chance that someone is going to get hurt or someone is going to get lost. I hope everything goes smoothly, but there’s a fairly decent chance that it won’t. I don’t want anything bad to happen to anybody. And I certainly don’t want anyone to come back at me and hold me responsible. As you mentioned, the popularity of bikepacking and adventure touring is growing at an amazing rate, thanks in part to events like those that VeloDirt puts on. Is there a bit of a fad element to the popularity or will large numbers of people continue heading out into the backcountry on their bikes? 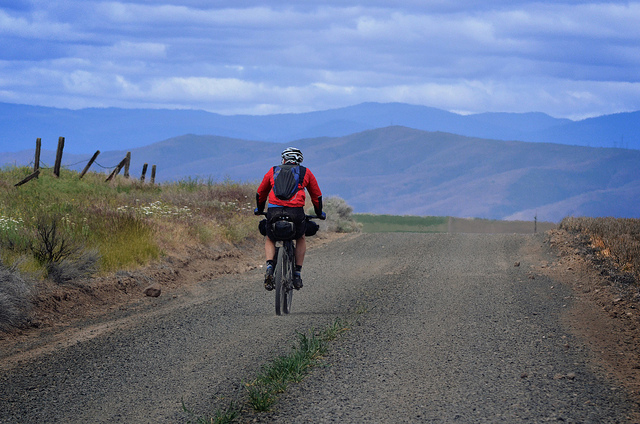 At least for Oregon I don’t think it’s a fad, any more than when regular bike touring started getting bigger. Once you have all the gear, there are so many places in Oregon for you to ride and to put trips together. Pretty much the whole West is like that, but Oregon has so much unique riding. You can be on the coast or you can be out in the desert. I don’t see it as something that’s going to blow up and fade away. You can probably say that about fat biking and stuff like that. 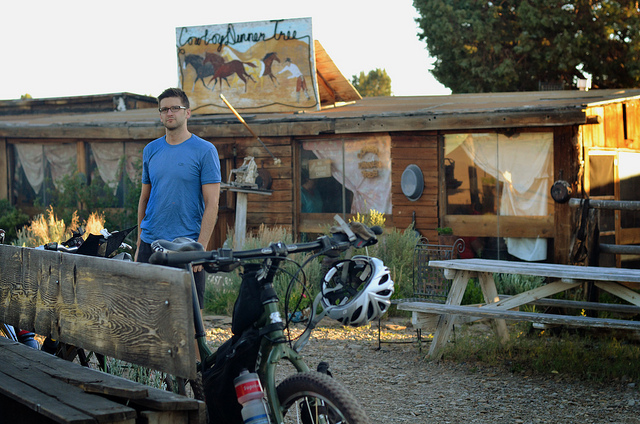 But I think bikepacking is going to get big and it’s going to stay big like bike touring did. Bike touring’s been around for a long time, but it keeps growing because people continue to discover how easy it is and how fun it is. And I think that will happen with bikepacking as well. Are you already thinking about the next thing for VeloDirt or is the Outback taking up all your time right now? My plan for the next couple of years is to put together another four to seven bigger bikepacking routes in Oregon and put all the information out there with route details and such, like we did with the Outback. We’ve got pages on the webstite that have all the information you need to at least get started planning your trip. I want to do that for a whole bunch of rides around the state. We won’t necessarily do any sort of organized rides on them like we’re doing with the Outback, though. Look at what the Adventure Cycling Association did with the Idaho Hotsprings Route and the amount of interest they’ve gotten in it. If you put routes out there, people will go ride them. They need that nudge for whatever reason. I like exploring new routes that I don’t know anything about. For me it’s not necessarily fun to follow GPS tracks. But I know that’s what most people end up doing. And there’s nothing wrong with that. I think it’s awesome. And that’s where I want to push things next. I want to create a network of routes that people can go do around the state. Kind of like what Ellee Thalheimer did with her Oregon bike touring guidebook, but less information, all online, and it will all be free. 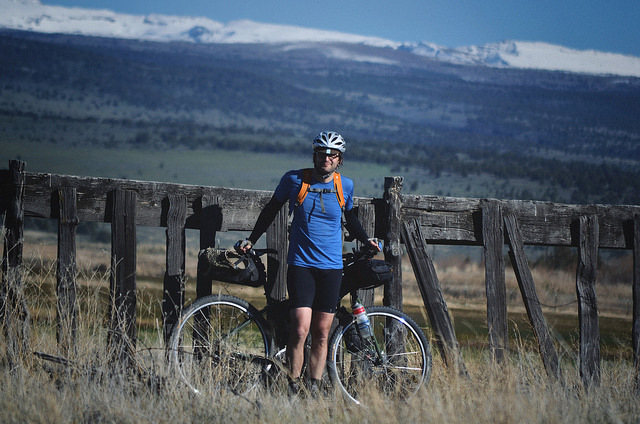 This entry was posted in Bike Touring, Interviews, Mountain Biking and tagged bike touring in oregon, bikepacking, bikepacking in oregon, donnie kolb, gravel grinding, oregon outback, velodirt. Bookmark the permalink.